Martin Luther King Jr. Day is an important day to celebrate diversity and peace in your classroom. Important lessons of racial and social justice can empower teachers and students. We can explore those concepts on this special day or throughout the school year. Science is a great way to provide the concept of black and white, civil rights, and social awareness. 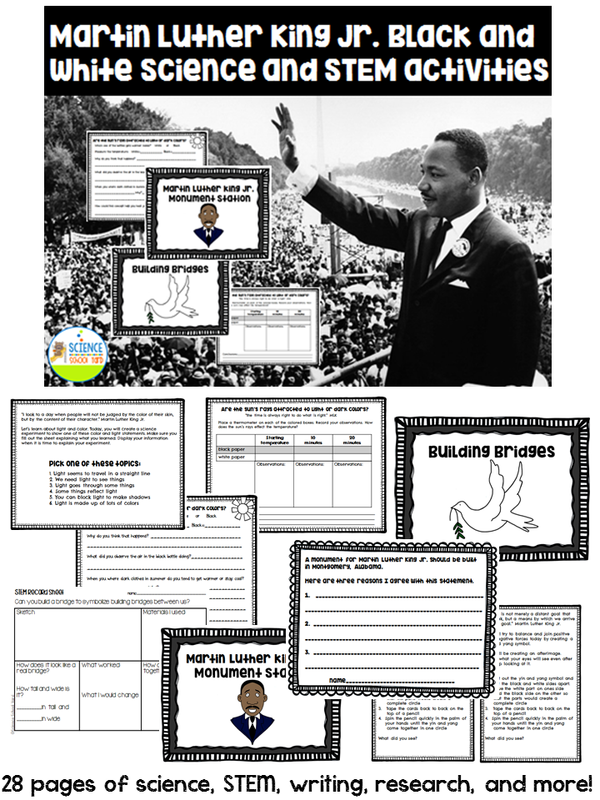 This post can help find ways to integrate science to teach Dr. King's message. 5. STEM connections that include building a bridge and a monument in Montgomery, Alabama to honor Martin Luther King Jr. I love this pack because it allows me to add science and STEM lessons to reading and writing activities! Want 28 pages of Science, STEM, Writing, and Research for your classroom? Find It here! One way to connect with the Science and STEM pack or during your writing time is to watch some of his famous quotes. I will be re-watching the video and stopping to read the quotes to the students. I am including the quotes here for you to use! Find the Free Quote Sheets HERE! Whether you read a story, show a video, connect a science or STEM activity or continue each and every day to teach tolerance, peace, and the message that someday that all of us can be "brothers and sisters" no matter the color of their skin you are helping to keep his dream alive!